What can make a Roger Stern Spider-Man script even better than great? John Byrne’s art! Who cares if The Ringer is dopey. The story works, and the art is great! 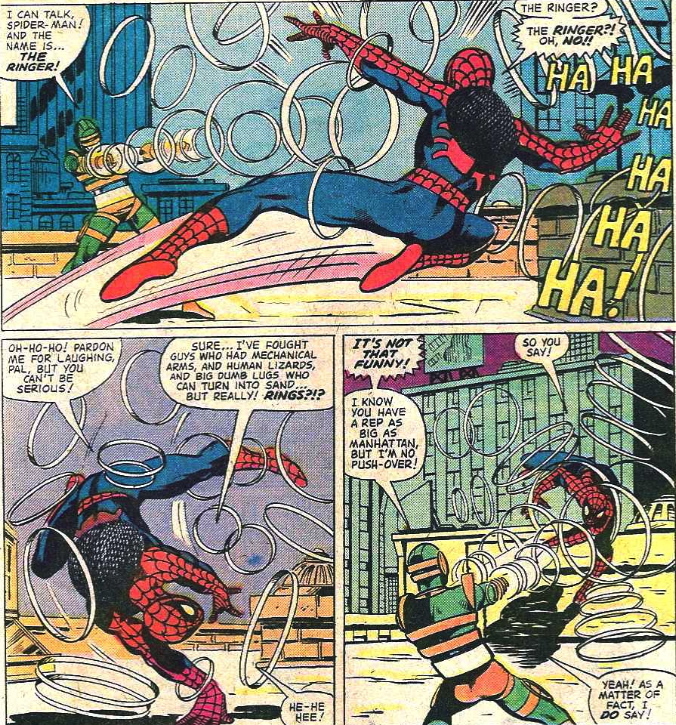 The weirdest thing about this story is that The Beetle is the guy who forced Ringer to attack Spidey, because he was gathering information about the Webhead for future criminal gain. Before now, I can’t remember The Beetle being this kind of a well-thought-out threat. (Of course, he did hire The Ringer, who is basically a dud.) Nice new Beetle costume, though. On the Peter Parker side, he’s now teaching at ESU and we meet a new student: Greg Salinger. Yeah, he’ll become Foolkiller, so this is his first appearance, albeit as a civilian character, not as the second coming of the villain. STEVE ROGERS WILL BE CAPTAIN AMERICA AGAIN—SO DOES CHANGE EVER MATTER?